Fizz Beach Lounge, Sairee Beach Koh Tao. With a great location on Sairee Beach, this bar is a lovely place to chill and soak up the ambience. Bean bags are sprawled across the beach and large deck making it the perfect place to start your evening with a cocktail by the sea while enjoying great music. Bar Next Door, Chalok Ban Kao, Koh Tao. We had a fun night out at this bar. Perched on the beach in Chalok Bay, this was our pick of the bars on the strip. 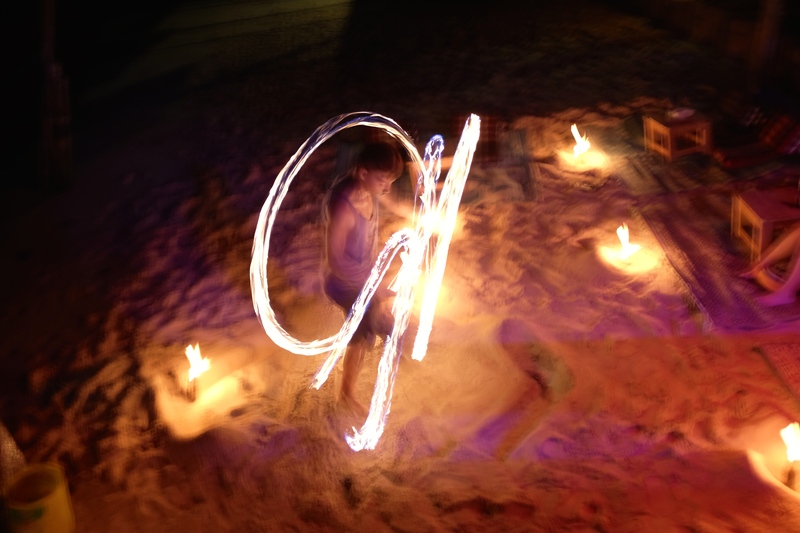 Be entertained by fire dancers while drinking the night away. You just need to be able to stomach what was the worst toilet (if you can call it that!) on the island. Whitening Bar & Restaurant, Maehaad, Koh Tao. We ate twice at this restaurant. Once for my friend’s birthday and again a few days later. The restaurant true to its name has white decor with a mixture of tables on the beach if you’re there to enjoy a meal, or bean bags and low tables if you’re more inclined for a relaxed snack or a cocktail or two. The menu is a mixture of Thai and “fusion” dishes, with BBQ seafood and salads. Knowing that it was a special occasion, the staff were able to arrange a birthday cake and they catered well to a large group. It was a nice treat to enjoy some wine after an onslaught of cocktails over the week. Barracuda Restaurant, Sairee Beach, Koh Tao. Another restaurant where we went back for seconds. This popular restaurant caters well for groups where you can enjoy a tasty tapas style menu of seafood, sides, and salads. The atmosphere is relaxed and the staff and service is friendly. Just make sure you phone to book ahead. Bamboo Hut, Haad Yuan, Koh Phanghan. Perched on top of a hill overlooking Haad Yuan, this is a great place to dine for lunch or dinner while taking in the view. Galanga Restaurant, Chaweng, Koh Samui. It’s always hard to know with a long strip of restaurants what one to dive into. It’s often hit or miss, but Galanga was a hit. With a varied and extensive menu there’s plenty of choice, including wine and cocktails. Namh Restaurant, Bangkok. Voted as one of the world’s top 50 restaurants, Australian-born chef David Thompson produces some of the best Thai cuisine in Asia. Sadly I missed out eating here as my cab driver couldn’t find it! 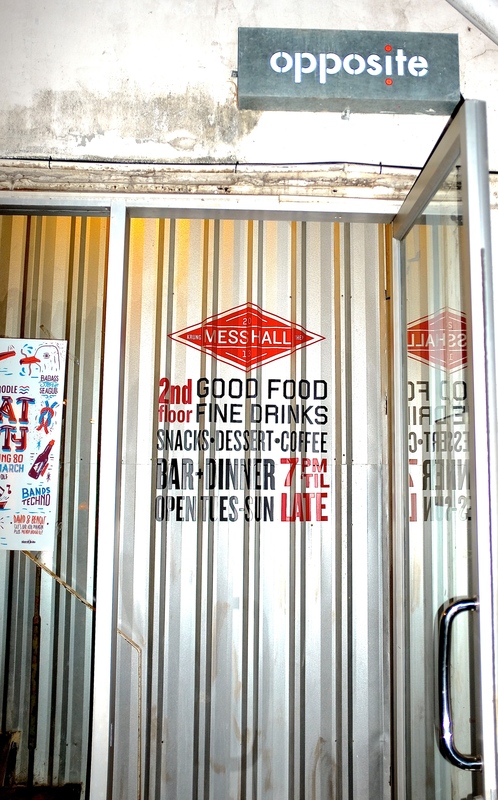 Opposite Mess Hall, Bangkok. Enjoy cocktails and asian inspired tapas. I had a great meal here with great company. Sky Bar at Lebua State Tower or Moon Bar at Banyan Tree Hotel. 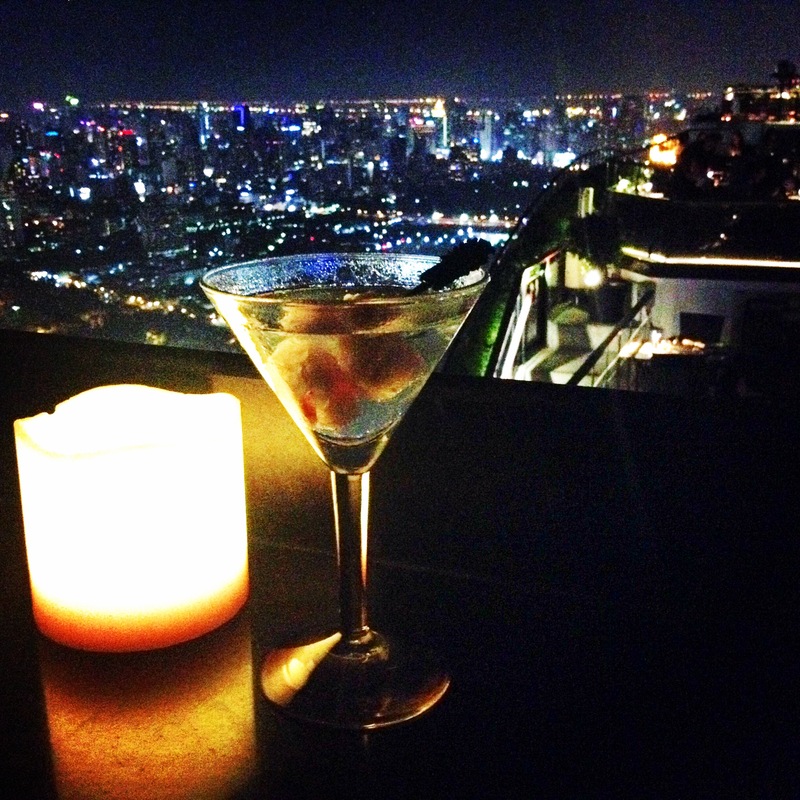 Moon Bar is one of my favourite places in the world and will always be on my list to go to when I’m in Bangkok. The prices are worth the views. And last of the recommendations in Bangkok are Coffee at Roots, open Saturdays & Sundays from 12pm. Breakfast at Rocket, located in Sathorn. Late night drinks at Wong’s Place (best after 2AM) and Street Food on Soi 38. I’m looking forward to trying these out on my next visit.